Tactical vests are used by military and law enforcement to better carry equipment that provides a tactical advantage during a combat situation. 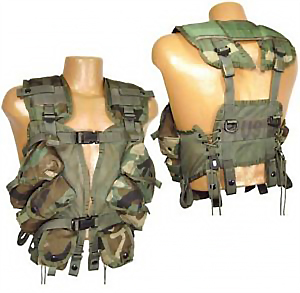 A tactical vest typically comes outfitted with several compartments including but not limited to: radio pouch, universal pistol magazine and flashlight pouches, sniper shoulder strap, shot shell holders, adjustable rifle magazine pouches, pistol holsters and a belt with additional pouches and holsters for guns and/or knives. ISO Group has tactical vests that also have fragmentation grenade pockets, canteens, strobe / compass pouch, 30-round ammunition magazines for M-16 rifles and more. There are different types of tactical vests. The Modular Tactical Vest (MTV), which is used by the U.S. Marines, comes equipped with body armor. Others provide floatation. All tactical vests are made with the need to balance comfort, mobility and safety with maximum tactical effectiveness so a soldier or member of law enforcement has the equipment they need in combat or other types of hostile situations. The following NSNs are associated to Schedule B 9803100000: military wearing apparel of all types and materials, including footwear and headwear. The Schedule B End Use is listed as military apparel and footwear. NAICS classification category 314999.